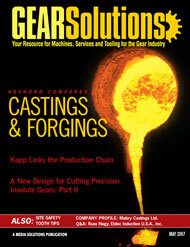 With a history of dedication to service & quality, this company is poised to provide gear manufacturers with the castings they need to ensure success. When designing large structural components it’s critical to make an informed decision between castings and forgings. The following paper by Rexnord provides an in-depth examination. As part of the Kapp Group, Niles has designed machines that decrease the cost per piece while increasing the quality of the finished parts. Seeking input from your employees is one of the best ways of helping you create—and update—a comprehensive and effective safety plan. Shot peening offers a variety of benefits to gears, including added strength and reduced surface fatigue. The past—and future—of the process are discussed in this installment. Marketing Manager Eldec Induction U.S.A., Inc.